On 15 May 2011, one poster on the streets of Barcelona summed it up well: Democracia: te quiero, pero te siento un poco ausente. (“Democracy: I love you, but I feel you have grown a bit absent”). Hundreds of thousands of angry Spaniards took to the streets, shouting, “No nos representan!” (“You don’t represent us”), and “Si, se puede!” (“Yes, you can!”). This day, known locally as 15-M, represented a significant shift in Spain’s political scene. Protestors were not only protesting the government’s austerity measures, but were rebelling more generally against Spain’s political culture. Four years later, municipal elections shook up the country’s traditional political party system. People crowded the streets of Barcelona once again, this time to celebrate the victory of Ada Colau as mayor. Colau, an anti-eviction activist, made her name as a founding member of Plataforma de los Afectados por la Hipoteca (PAH), a housing rights movement that gained visibility in the 2011 protests. In Madrid, people celebrated the victory of Manuela Carmena, a prominent judge and human rights advocate. Spanish voters were sending a clear message: they wanted “ordinary people” in power, and they elected two strong, high profile women linked to the social movements that had spearheaded the 15-M protests. What were the good and bad aspects of being “solid”, conventionally organized entities in a “liquid” world of quickly evolving individuals and social movements? Traditional political parties have scrambled to figure out what mass street protests mean for them, but so have civil society organizations, including prominent rights groups such as Observatori Desc, Salud por Derecho, and Ecologistas en Acción. How were these organizations affected? What were the good and bad aspects of being “solid”, conventionally organized entities in a “liquid” world of quickly evolving individuals and social movements? In May and June of this year, I interviewed dozens of people in Madrid and Barcelona, seeking answers to these questions. Their answers were quite similar to those in Brazil, where organizations have been affected by street protests since June 2013. Many NGO leaders described 15-M as an amazing “burst of energy”. “Where were all these people last week?” asked Concepcion Garcia of the Ecologistas en Acción, a confederation of 300 organizations working with environmental rights. 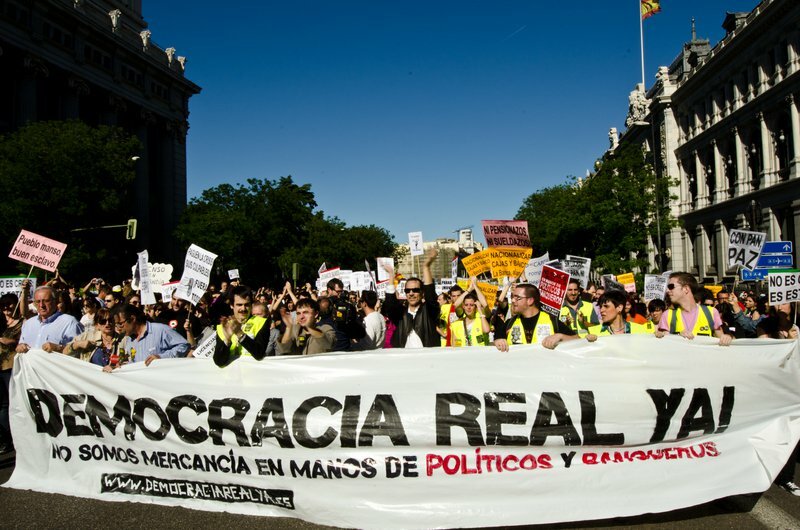 The 15-M movement calls for, "Real democracy, now!" in Madrid in 2011. Normally, “solid” mainstream NGOs plan their activities in 12 or 24-month cycles. They have medium and long-term projects, clear timelines, impact markers, “strategic frameworks” and donor reports to fill out. The street protests of 2011, however, brought the political day-to-day into the daily work of NGOs. They felt the need to be more connected to “the lives of ordinary citizens”, and better able to take advantage of windows of opportunity. Virginia Alvarez of the Amnesty International office in Madrid, for example, estimated that over 50% of what they currently do is no longer planned in advance. Instead, they now hold weekly meetings to detect trends and opportunities. “What changes is the context,” Alvarez stressed. “If we previously worked with state violence only within prisons, now we also incorporate the police violence in the protests.” It became more evident that flexibility in planning and financing is key, leaving room for the unexpected. As a direct result of the 2011 protests, many Spanish NGOs find themselves working on all manner of new themes, including “the right to the city,” which emphasizes sustainability, democracy, equity and social justice. They are now also working with groups and people with whom they previously had no connection. “Since 15-M we have begun working with unconventional actors, such as the Spanish economists and the Spanish physicians association,” said Vanessa Lopez of Salud por Derecho. Some organizations reported that it was (and continues to be) hard to balance the “speed that the streets demand” with the institutional processes to which they are used to. There was also friction between the “individual activism” of team members, and their “institutional activism” as members of NGOs. Some of my respondents said that when they want to be “real” activists, they do this outside their organization. With the 2011 protests, groups that were the Spanish branches of larger international organizations, such as Amnesty International and Medicos del Mundo, also found themselves demanding more autonomy from the central office. As local conditions were unique and fast changing, they needed the independence to experiment. After 15-M, many NGO workers now feel that it’s easier to explain what organizations do, because society is more politicized, and more open to listen and engage. “But we have to have a more diverse and customized options menu so that they can choose what kind of relationship they want to have with us,” said Tomas Hernandez of Médicos del Mundo. There is no doubt that the 15-M protests in Spain have shaken up the country’s civil society sector, and not only the country’s electoral politics. “The organizations’ toolbox widened after 15-M,” summarized Jordi Vaquer, from the Open Society Initiative for Europe (the office of Open Society Foundations based in Barcelona). The balance between innovation and persistence is difficult. However, as Joan Subirats from the University of Barcelona warns, “We are living through a changing era, not a temporary crisis, and the only way forward is to adapt and change.” Street protests exemplify several symptoms of this new era. But are we humble enough to listen to them?